Firstly you have to fill in your the IMEI and VC number of your Infinix smartphone in box provided in the platform. 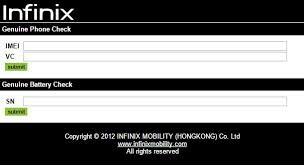 The IMEI of your Infinix phones are generally written at the back, yet you can then again get the IMEI by dialing *#06#. To get the VC number, you need to look at the battery or the phone itself. It is typically found beneath the battery compartment. 2: Insert your IMEI and VC number for Phone verification and SN for the battery. 3: Submit and wait for results.